ABOVE: Entrance of the Hotel am Kaiser on Futterstrasse. The three-star Hotel am Kaiser (formerly the Hotel am Kaisersaal) is across the street from Erfurt's historic Kaisersaal, an 18th Century ballroom that is now a cultural and conference center. 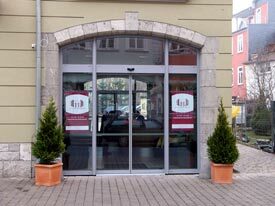 The hotel is ideally located on the Futterstrasse, just around the corner from the cafés and restaurants of the Wenigeplatz and the historic Krämerbrücke stone bridge. Although the hotel's façade is centuries old, the interior is new and modern. The pleasant lobby has a small seating area with a good selection of German magazines, and there's a small bar attached to the reception desk where you can order a drink or a coffee. The lobby has two sets of glass doors: one facing the street (see above), and the other opening onto a parking lot in the courtyard. Upstairs, the Hotel am Kaiser has 35 guest rooms, including two large rooms for families. Furnishings are functional and attractive, with large built-in wooden storage units and wooden beds that have duvets and down pillows. For more information, including prices, see the Hotel am Kaiser Web site.